T-Ann is much like her mother. She has too much attitude and is having way too much fun when she sees the judges. She is a very sound young girl and moves out very well. 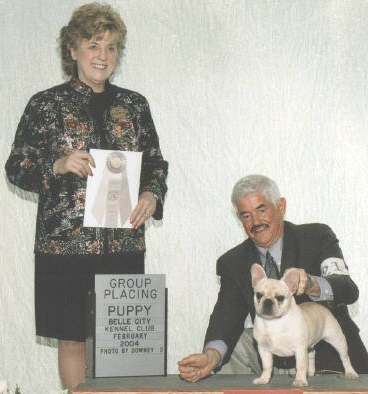 She finished her Championship easily with three majors and a BEST Puppy and Puppy Group Three by nine months old. T-Ann made it to the final cut at the Dallas Ft Worth French Bulldog Regional Specialty preceeding the National specialty AND made three cuts at the French Bulldog National Specialty at the young age of 13 months old! Copyright © 2003 - 2005 House Of Tucks French Bulldogs, Doherty Kennels & JLS Canine Services Web Design.